Contrary to what you might think, very little equipment or space is required to work out effectively from your home. Much can be done through calisthenics alone, which requires only enough room to be able to lie down and stretch your arms and legs out to your sides. However, the more equipment and space you do have, the greater the variety of exercises which can be done. And of course with greater variety, the more interesting and challenging you can make your workouts and the better your overall development will be. This section of the site therefore outlines my recommendation of what equipment is important to have versus what is nice to have. Budget is always a consideration, so invest in the important stuff first and then if you find that working out at home suits your lifestyle and training objectives you can always invest in the nice to have stuff down the road. Resistance tubing with handles - Comes in various forms and levels of resistance (bands are generally colour coded for resistance level), so make sure you try before you buy. Smooth tubing is generally the cheapest and works just as well as the sleeved tubes. (Sleeved tubes are supposed to last longer and protect from nicks or irritation from the rubber, but I personally have never experienced a problem.) However, the sleeve does provide some protection to the rubber tubing should you do exercises while standing on it and therefore it's handy to have at least one tube in this format - either full or partial sleeved. Dumbbells - Just about every fitness store is going to carry a wide range of dumbbells. The hex-shaped dumbbells are most commonly sold for home use, either solid metal (cast iron with stainless steel handles) or rubber coated. The rubber coated ones are nice because there is less risk of damaging the floor if you set them down too hard, but because they are much larger than the solid metal version they start to get pretty unwieldy after about 40 lbs. Dumbbells will cost about $1-$1.25 per pound, give or take, so try before you buy to ensure you purchase the right size. You don't want them too light or too heavy to work with effectively. You will need to budget for heavier weights as you get stronger. Note: Dumbbells come in various grip sizes. Being a woman, I find with my smaller hands that it's difficult to hold onto the wider grip dumbbells at heavier weights, particularly during lifting motions such as a shoulder front raise. The weight of the dumbbell forces my thumb and forefinger apart so that my grip loosens, which could be dangerous. Therefore, I recommend you purchase the narrower grip dumbbells - again, try before you buy. Exercise ball - Exercise balls are made of soft PVC and come in various sizes - anywhere from 14 to 34 inches (35 to 85 cm). Buy one large enough that you can sit on it comfortably with your feet flat on the floor and also wide enough that when you lie on it your upper back will be properly supported. Medicine ball - Medicine balls come in various sizes from 2-30 lbs (the larger the size, the heavier the weight). While you want to purchase as heavy a ball as you can manage, you need to make sure the size is still small enough for you to grip comfortably with both hands and not feel like it's going to slip out of your grip when you reach towards the ground with it. A handled medicine ball is great to use for some of the functional exercises you'll be doing, but the handles do limit the number of different exercises you can do with the ball. Workout gloves - I highly recommend you purchase a good pair of workout gloves to protect your hands from calluses and blisters that will develop from keeping a constant tight grip on your dumbbells. 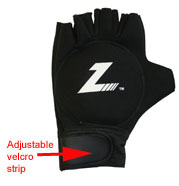 Workout gloves will also improve your grip, an important safety consideration. Look for a pair of gloves with wrist support - the gloves will extend down over your wrists and fasten with an adjustable velcro strip right at wrist level. Yoga mat - While a towel or blanket will do in a pinch, the extra padding in a yoga mat will allow you to be much more comfortable when doing floor exercises. And when you're comfortable, you can better focus on what you're doing. You can get a decent yoga mat for about $20 at places like Wal-Mart or Sears. Full length mirror - Those muscle heads at the gym who stare at the mirror while doing their sets are not narcissistically admiring their muscles (although some of the ladies might be LOL), they�re watching their form to ensure they maximize muscle development and minimize risk of injury. You also need to critically analyze your own form for the same reasons. Most department stores carry fairly inexpensive lightweight, full-length mirrors you can either hang on the back of a door or store in a closet and then pull out and lean against a wall when you're working out. 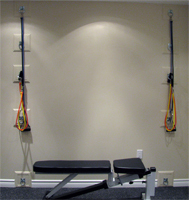 Resistance tubing with clips - Tubing with clips is a great addition to a workout area if you have room in a basement to insert rings into the wall approximately arms length apart. With this "tubing work station" you can then do two armed exercises such as chest presses, punches or flyes. (Make sure you insert the rings into studs or they will come right out of the wall.) When I refinished my basement I had my contractor insert pairs of rings at five different levels on the wall to give me lots of flexibility. When I want greater or lesser resistance I simply add or remove one length of tubing. 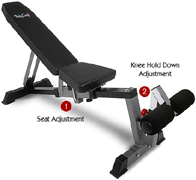 Adjustable workout bench - If you have the room, a workout bench with an adjustable angle of incline allows you to hit your muscles from more angles, which will result in better overall development. If you do have room for a bench, try to find one with a leg attachment so that you can do leg exercises such as extensions and curls. Bosu ball - Although a bit pricy (around $150), a bosu ball allows you to progress your floor exercises to make them more challenging. Bosu balls are used by many trainers primarily for balance and core work, but you can do an entire body workout with them. Particularly when turned upside down so that flat surface is in the air, Bosu balls challenge your balance and thus really work the supporting muscles. 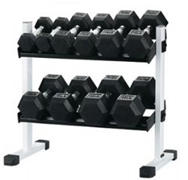 Dumbbell storage rack - As your strength increases, you will need to purchase heavier dumbbells. At some point they will accumulate to the point where it's difficult to store them. It's stressful (and dangerous) to work out in a mess, so once you're at that point a dumbbell rack is a good investment for keeping your workout area tidy (and safe).